Friendbuy is a referral marketing platform that powers modern day word of mouth. Designed for growth marketers, Friendbuy allows companies to acquire new customers at scale through seamlessly integrated referral and influencer campaigns. These events can be passed to your Segment Destinations such as data warehouses and analytics tools. Joined with data from other marketing programs, you can start telling a unified story of each customer’s journey and tailor your reporting to the KPIs that matter most. Copy the Segment write key for Friendbuy from the Overview page. 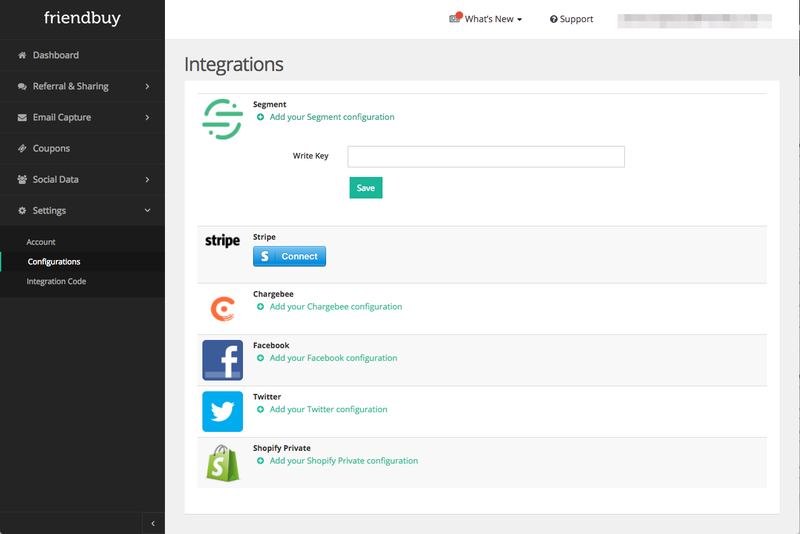 Login to your Friendbuy account and enter this Segment write key at this location: Settings>Configurations>Integrations. From your Segment account, click into your Friendbuy Source and you’ll be able to add other downstream Destinations where you want to see referral events. You’re all set! Referral events such as shares, conversions, and reward evaluations will now be sent to Segment and any other destinations that you’ve enabled. All referral events provided to Segment are in the context of specific customer (the advocate). Below are the customer attributes that Friendbuy provides to Segment along with these events. Wherever possible, customer data is mapped to Segment’s reserved properties as defined in the Segment Identify spec. Below are the events that Friendbuy sends to Segment. These events will also appear in your Destinations, depending on which platforms you’ve enabled in Segment. Referral Shared An advocate shares with a friend through a Friendbuy referral widget (or REST API) to a channel such as email, Facebook, Messenger, Twitter, etc. Below are the properties that are included in the Referral Shared event payload. Below are the properties that are included in the Referral Converted event payload. Wherever possible, referral conversion data is mapped to Segment’s reserved properties as defined in the Segment Ecommerce spec. Below are the properties that are included in the Referral Reward Evaluated event payload.